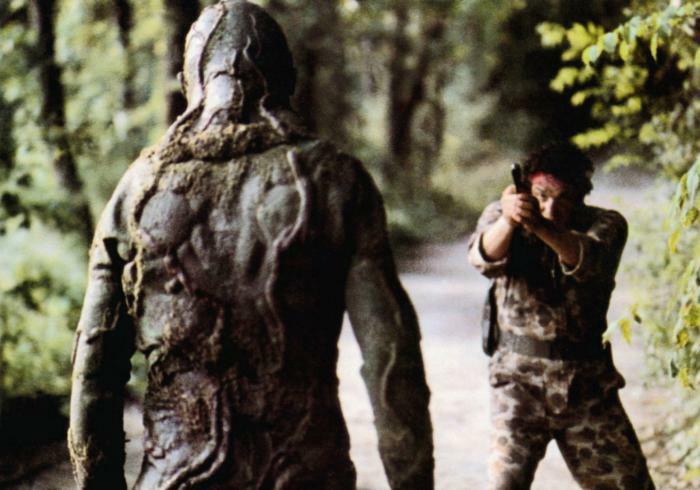 SWAMP THING: The Swamp Era Of Wes Craven’s Wilderness Years – Schlockmania! The early 1980’s were a strange time for Wes Craven: he was caught in a sort of limbo period between his initial one-two punch of Last House On The Left plus The Hills Have Eyes and his later success with A Nightmare On Elm Street. During this time, he had to take whatever came along in his bid to get a Hollywood-level filmmaking career going. Swamp Thing was one of the films he made during this time, perhaps his most overt attempt at being commercial. Though it is not entirely a success, it’s more interesting (and entertaining) than it often gets credit for. Swamp Thing draws its inspiration from the original Len Wein era of the comic and takes a classic “origin story” approach. 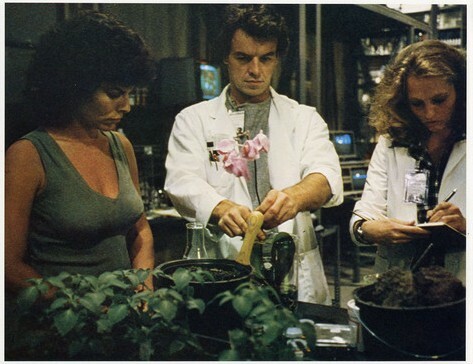 It begins with government agent Alice Cable (Adrienne Barbeau) being sent out to the swamps to observe the work of Dr. Alec Holland (Ray Wise), an idealist working on a formula to strengthen plant life by incorporating animal DNA. 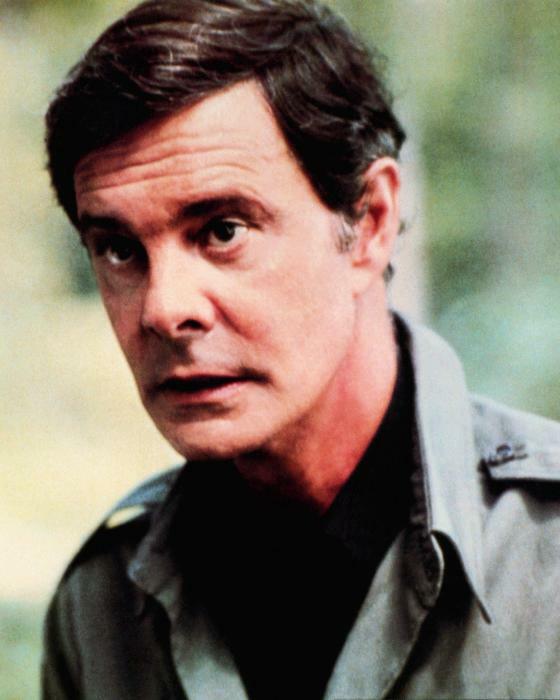 Unfortunately for both people, the project is ambushed by thugs organized by Arcane (Louis Jourdan). In attempting to steal Holland’s formula, they trash the lab and Alec appears to die a fiery death after being doused in his own formula. Cable goes on the run with help from swamp-dwelling local Jude (Reggie Batts) as Arcane hunts for them and tries to reassemble Holland’s formula. It seems certain that Cable is doomed but she gets help from an unexpected ally – a creature who seems to be made out of the swamp vegetation but has the strength and communication abilities of a human being. This is Alec, now transformed into the “Swamp Thing” – and it’s inevitable that he and Arcane will have a battle that determines the fate of everyone involved. It’s a miracle that Swamp Thing is as watchable as it turned out to be. Craven was doing work-for-hire here, sidestepping his normal strengths as a horror auteur to do what is essentially a comic book adventure story with horror/sci-fi elements. To make things even tougher, Crave n was working with inexperienced producers and the budget and schedule became tight as shooting in real swamps created a lot of problems. As a result, the second half of the film seems rushed and incomplete – and Bill Munn’s makeup effects, which the film leans on as it progresses, come off poorly due to the time and budget constraints. However, viewers who can dial back their expectations and overlook the aforementioned rough scenes will discover the proceedings are actually quite fun. Craven’s popcorn-movie instincts are on-target here and he manages to craft a fast-paced narrative here with an agreeably pulpy style. The non-effects- driven action scenes are pretty decent, too: a boat chase is fairly exciting and the siege on the swamp lab boasts one of the greatest fire stunts in film history, thanks to stuntman Tony Cecere. It’s also worth noting that the “beauty and the beast” love story angle between Cable and Alec works surprisingly well, even after he has become a swamp creature. 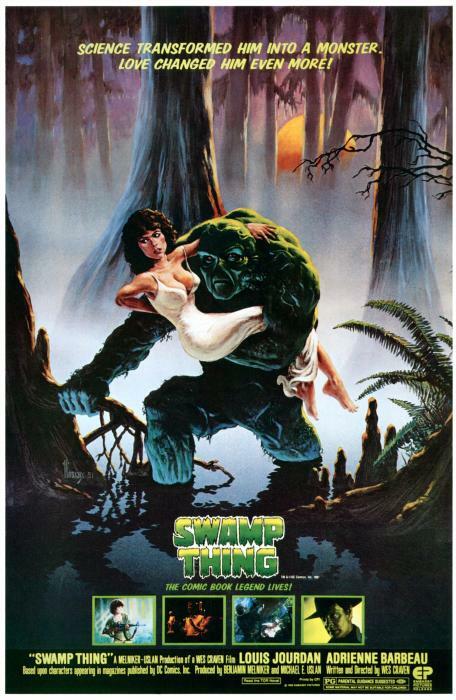 More importantly, Swamp Thing boasts an excellent genre flick cast and Craven uses it well. Barbeau was in the middle of her early ’80s golden era as a sci-fi/horror queen and she hits the right blend of strength and vulnerability to flesh out her characterization. Wise shines in the first part of the film, long before he became known for Twin Peaks, and stuntman Durock brings an unexpected soulfulness to his scenes as Alec’s swamp incarnation. Jourdan’s villain is campy in a good way and Batts shows a sly, smartly underplayed sense of comic timing that makes him the rare “kid sidekick” that is actually likeable. The cherry atop the sundae is seeing exploitation vets David Hess and Nicholas Worth doing light, comic book variations of their earlier exploitation film personas as Arcane’s main henchmen. In short, Swamp Thing might be second-tier work in the Craven filmography but it’s pretty decent little programmer on its own merits. The cast alone makes it worth a look for exploitation film buffs – and the film’s hints of popcorn movie flair show instincts that would pay off in later Craven films like The People Under The Stairs and Scream.